Our newest Do-It-Yourself Podcast topic module features a launch vehicle systems analyst, aka rocket scientist. Tristan Curry explains the concepts behind launching a rocket. Besides explaining the importance of the basic parts of a rocket, she also explains scientific principles in relation to a rocket. Your students can incorporate clips of Curry explaining Newton’s laws, gravity, thrust and safety. Education specialist Fred Kepner also explains how to find the center of gravity and center of pressure on a rocket and why those points are important to a rocket’s stability. Although NASA applies these science concepts in building and launching rockets, the same principles apply to model rockets. The module includes 34 video clips and 10 audio clips. The video clips include footage from space shuttle, Atlas V, and Delta II launches and animations. We’ve also included historical footage of the Saturn V, German rocket launches from the 1940s, and newsreel footage of workers assembling Redstone missiles. 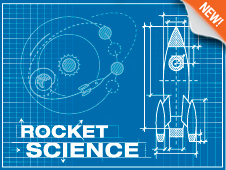 Students can shoot video of themselves building a rocket to mix with the rocket scientist explaining the science. The Rocket Science module also includes links to images and other resources to support student creativity in building a podcast.